One of the hurdles of having a dual point of view (POV) is making sure readers like and care about both characters in the story. This is doubly hard if there’s conflict between them, but that conflict is something to be overcome, not the thing holding them back (as in, the second POV isn’t the bad guy). What Do You Mean You Don’t Like Me? I was once chugging along on a manuscript when I noticed that my male POV was a lot more likable than my female POV. There was a pretty good chance that readers would identify with him and feel negatively toward her. She’s not dislikable or anything, but she's a cool, calculated spy, and she came across that way. That was fine when it was a one-person POV spy novel (cause she was pretty cool), but after I added the second POV and a romance angle, she needed to be warmer. She needed to be a good match for the male love interest. And she wasn't. A more likable character leads to readers being more interested in that plotline, and you could risk one whole side of your book being skimmed or worse, disliked, if readers don’t care about the other character. Not good for a story. Showing a likable quality helps readers like a character. Concern for others is a nice trait, so I added in a layer of caring. My female POV started worrying more about the people in her life (like the eventual love interest). She still had her own selfish concerns of course, but she was aware of how other people were affected, and that made her nicer. My girl started the story as a firm believer in what she was doing, but by the end of it, her views on right and wrong would change. Not getting to that soon enough was making her feel a little self righteous (and bad), so I let her second-guess a few things about her mission, question her motives, and react to things in a negative way that normally would have seemed normal to her. Since she was my protagonist, it was important for readers to sympathize with her. Trouble was, the way I’d set it up originally, her actions toward the other POV made that hard to do. Readers liked him way more, so anyone who was mean to him was “bad.” No one was going to like her just because I said so. I had to show that she was in a bad spot, doing what she had to do, and would have done things differently if given a chance. This was a particular challenge for me, because winning wasn’t so black and white in this story. Both sides had a lot of wrong assumptions, and neither was really right. And if readers preferred my male POV, then there’s a very good chance they’d consider his perspective the right one and think my female POV was the bad guy. I had to show that her ultimate goal meshed with his, and that her beliefs were every bit as important. Readers needed to want her to win, same as they wanted my male POV to win. I was much happier with her POV when I was done. Having a little mystery and uncertainty to her character at first was also a nice hook and added tension overall. Redeeming her was something I played with later, and that “I like her but I don’t trust her” feeling worked very well in that regard. If you run into a not-as-likable character as the other POV characters, look to see where you’re weak. Are they not coming across as caring? Do their goals not matter on a personal level? Are they too negative toward a well-liked character? Are there enough reasons to like them? A few tweaks may be all you need to get that character back into the reader’s good graces. Have you ever written a less-than-likable character? What about one POV that steals the show? But one was from the POV of my heroine, the other from the POV of her hero. My current WIP is dual POV, but I find myself writing most from the heroine's eyes. Not because she is more likeable, but because there is a huge element of secrecy about the hero and I don't want readers to know what it is too early...I have NO IDEA if this works or not (Grrrr) I'd say 2/3 of the story is from her POV as she tries to solve the puzzle surrounding the hero. Can it work or is it doomed? I think it can work, Roberta. Most of my dual POVs involve changes in POV, tense, and style, too, but then usually the "dual" bit is a little piece at the end of each chapter. In one book, it actually makes about 1/3 of the book (and more than one beta loves that one, though there are still some issues I need to hammer out). I often find it helpful to write one plot line, then go back and finish the other. Awesome post, Janice! My last WIP was a dual POV and boy did that teach me a thing or two. I had the exact same problem. In my case, it was because I just adored my male POV and didn't think my female POV was good enough for him. LOL. Yes. I probably need therapy. What it boiled down to was that _I_ had to love her before I had any chance of making my readers do that. Writing her to make me love her, made her more likable for everyone else. At least, I hope so. I think about those lessons a lot when I'm writing anything now, dual or single POV. This is a great post - in fact, I may have to revisit this topic on Friday (thinking, thinking)... In my WIP, I have triple POV, and I notice it's really important to let each character have something that makes him relatable(they're all boys in this one). Shared values with the reader is a big one, particularly since the world is so unfamiliar. But familiar weaknesses and pathos can be another (especially for an antagonist). I'm not dealing with a dual narrative but I realised after my writing yesterday that my MC was slipping into unsympathetic behaviour. I decided the scenes where she turns argumentative would be better placed in the second half of Act 2 since during the midpoint reversal something happens that makes her second guess herself. Her snippy dialogue would be more understandable if it stemmed from frustration and confusion rather than general moodiness. This post is like a sign from the universe that I'm making the right call! I had the problem of putting one too many POVs in my current WIP. I've handled three POVs before, but the third POV was only occasional and didn't have a complex arc. This time around I tried to make all three character arcs too complex and wound up favoring the third character over the second. So I am getting rid of the third character and giving his backstory to the second character. Suddenly things are working well! Great post, thank you! I'm working with this in my own WiP (one POV) and trying avoid her "save the cat" to make her more likable right up front. This gives me some great ideas. Thank you! But what if one POV is that of the antagonist who is not to be liked but maybe understood and empathized? Great post! In my WIP I'm realizing that I have to make my MC's goals more clear and pressing, so this came at just the right time. I've always written h/h POV (almost a "rule" in romantic suspense) but I don't like to go much beyond that. One book will have brief glimpses into the villain's POV, but I don't worry too much about people liking him! My work that's currently making agent rounds has 3 POVs, hero/heroine/villain. It's really hard writing the villain at first, but as the story evolves I find my villains become more sympathetic. So much so that I ended up not killing him off like I'd planned originally. I also find that I write more sympathetic and likable male characters at first. Roberta: Anything can work if done well (yeah, I know, not very helpful). I've found that if there's a big discrepancy between "page time" that often indicates the lesser POV might not be necessary, or needs a bit more to do in the story. But it really depends on what you're trying to accomplish with that extra POV. If it's there mostly because you don't know how to show that info any other way, that's a red flag that that POV is just infodump in disguise. 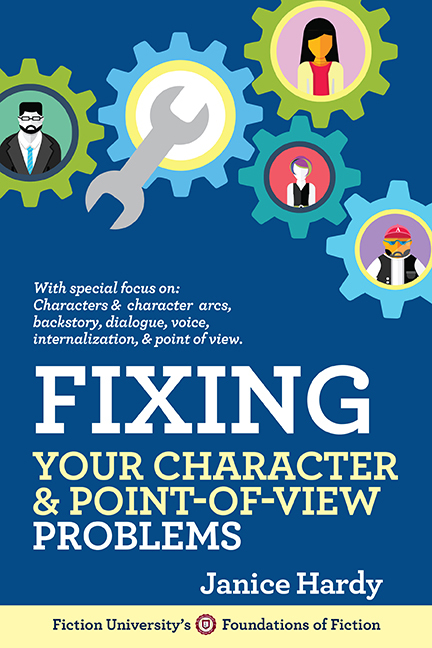 (even if it's good infodump) If the other POV needs to be smaller to build tension, develop another character that connects to the story, etc., then you might be fine. Roland Smith's IQ series has small interludes of the bad guys, and it works very well to keep you guessing what's going on and make you worry. Ask yourself: When readers get to the other POV, does it enhance the story and make them want to know what's going on with that POV, or does it just offer info and delay the story? Carradee: That POV switch at the end sounds unusual and intriguing. I don't think I've ever seen anyone do that before. Kathleen Duey said she's writing her Resurrection of Magic series that way. One POV first, then the other. Elizabeth: Combing things worked for me in Darkfall as well. It's a great technique, even if it does require a little work sometimes. Anon: Anatags are different. But even if the reader isn't supposed to like them, there should still be something compelling about them. Hannibal Lecter is a great example. Creepy, evil, not likable at all, but he was fun to watch. Chicory: Perfect! That's what I love about doing critiques actually. You see things others do (it's easier to spot them in someone else's work) and them wonder if you do that too. Terry: I can so see that! It's like the reader gets to know them as they get to know each other. GB Lashbrooks: I've always loved villains, so my POV villains tend to be likable, even when they're evil. It makes them so much better, doesn't it? You're nicer than me ;) I would have killed him anyway, LOL. Great tips for adding some sympathy to POVs. I love taking readers into multiple heads and never gave much thought to one perspective being over another, based on sympathetic response anyway..
Wow! This couldn't have come at a better time. Especially the "Ways to Question Beliefs." Thank you! I began my first novel from a 3rd person perspective switching back and forth between characters as they ultimately came together. It was suitable atmospheric but once I abandoned following the other characters and took up a first person POV the story really came alive. I applaud those who can craft a story so well using multiple POVs. It's very difficult to keep balanced. Great post. CVWriter: It was something I noticed before between protag sand antags, but this was the first time I noticed an issue in two protags. I love spotting stuff like this as I write. I pay so much more attention to what and why I do things now that I have the blog. Excellent post! It's an issue that really did come up in my triple-POV alternate-history. So glad to see it addressed. I adored my one sarcastic-rebel protag, liked the other warrior-woman protag too, but the third protag came out so whiny in the first draft I just wanted to slap him! Yes, I did some terrible things to him, but did he have to just sit around angsting about his problems all day?! Unfortunately, he was in a prison situation where he wouldn't be able to overcome or escape from the antag for most of the novel. Luckily, he did a 180-degree turn when I made him a gentle stoic. Now, the same terrible things were happening to him, but he was framing them as a quiet endurance test and he believed that his inner strength would eventually lead to his success. Everything the antag threw at him, he took as a challenge to demonstrate his patience and silent bravery, instead of wailing 'WHHHYYY MEEEE?' all the time. Then, at the end, when he finally realized he didn't need to put himself through hell (and nobody else should have either) that was a new kind of strength too. The resilient strength of self-acceptance. I love that change. What a great example of how changing a trait can change the whole character.